Dog sledding in Finland is something to experience! Enjoy both the silence of nature and the speed of the dogs. Dog power has been used for example for travel over ice and through snow over a thousand years. Nowadays dogs are still used for this in some parts of the world but also trained to give joy and memorable experience of winter safari. In dog sledding team there is a role for all dogs: there are leader dogs, point dogs, swing dogs, and wheel dogs. All they have their own task and by taking care of it, you will have a great experience dog sledding safari. Huskies are one of the main types of dogs that are used for recreational dog sledding in Finland because of their strength and speed and endurance as well as their ability to withstand the cold. Dog sledding safari is perfect for 6-10 persons groups. Total duration of the trip is approximately 2 hours and the length of it is 16-20 kilometres. During the safari you have also time to meet the dogs and get to know them. They are friendly and easy with children too. These dogs really love what they do and they are well taken care of. 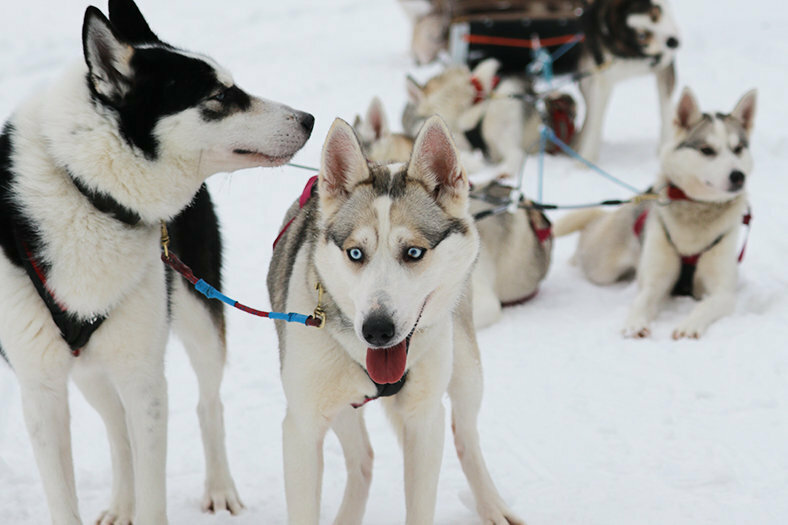 Fall in love with these strong and smart but very kind blue-eyed dogs and dog sledding! Read more and book this activity. Try also fat biking and kicksledding which are great way to explore winter nature. If you have smaller group or want to book the activity for only 2 persons, please contact our sales. We customize the safari suitable for you or your group. Meeting point address before the safari is Taipaleentie 60, 51460 Luusniemi. About 100 meters from the start there is 30 years old moose hunter shelter which is free to use for camp fire stop and fry sausage. For the safari we recommend warm clothes including warm cap or hat and gloves. - Suitable for 2-10 persons groups. - Buy this product from Our web shop.